COUNTRY LIFE: Members of the Pantomime Company in performance in 2012. The Golden Macca Fat is the title of the 2013-14 LTM National Pantomime, revealed to TALLAWAH during an exclusive chat with veteran wardrobe mistress Anya Gloudon-Nelson at an art show opening in Kingston recently. But, um, what exactly is a maccafat? "It's like a small coconut; feels like a calabash and inside there's a small nut that you can break open and eat like an almond," Anya explains. "We've been having fun with the cast to see who really knows what a maccafat is. Interestingly, the ones [trees] that I found while we were doing research were nears schools in St. Andrew." 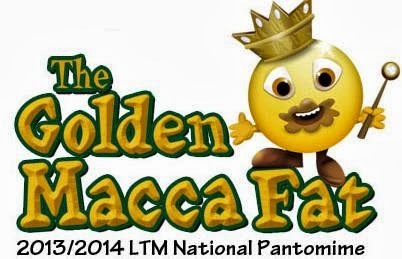 Speaking of schools, very much like its predecessors, The Golden Macca Fat is a family-friendly and community-based musical comedy penned by Barbara Gloudon, with original musice by Grub Cooper, set design by Michael Lorde and lighting by Michael McDonald. "It takes place in a Jamaican community, as is the traditional setting," Anya points out, "but this time around there's a bit of focus on the environment and how people try and make a living off it." With rehearsals now well underway, the pantomime will have its customary Boxing Day (Dec. 26) world premiere at the Little Theatre, before extending its run through May 2014.